There are loads of reasons why to create a custom input type. Maybe you want to create a color-picker or you want to create a dropdown which provides options based on a JSON-feed. No matter what you want - here's how to do it. Just fyi - I created an App to demonstrate everything I explain here. So You should still read this, but check out the settings etc. in the demo app which should help you understand it better. All input-types are registered in the system as entities of the type ContentType-InputType. All predefined input-types are registered in the central list but the content-type is available as Ghost-Content-Type in every App. If you need to know more about Ghost-Content-Types please read this blog. 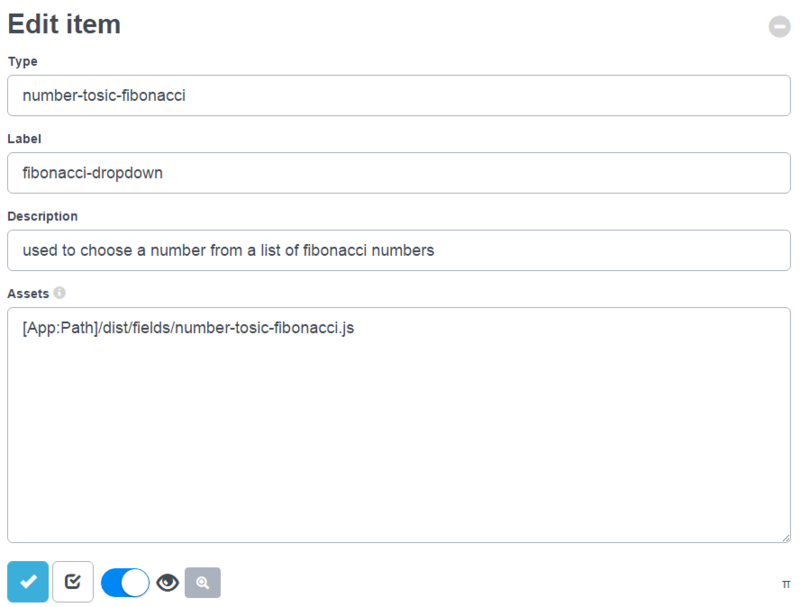 You you can see what I configured in my demo input for numbers, providing a dropdown showing fibonacci-numbers. The Type of your input-type is very important. It must begin with the data-type and a "-" and continue with something of your choice. The Label is the information shown later on in the drop-down. Remember that this value is shown after the user picked the data-type - so you don't have to write "this is a string…" since that was already selected. Basically you could include a long list of assets - like some libraries, some JS and some CSS - but you shouldn't. Too many assets slow down the UI and degrade the user experience. The best implementation has as few assets as possible, ideally just one. Modern development paradigms using Grunt will help you achieve this. You must tell the engine what an input-field looks like - this can be a simple "hello, nothing to do here"
Angular Parts are called modules. If you see code which says angular.module("…", […]) this creates a new module - which is exactly what we'll do. 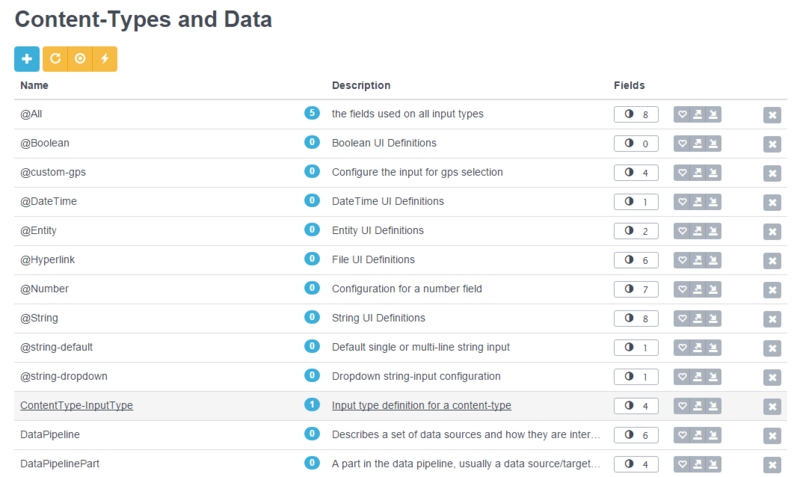 Each module contains things like initialization (run), configuration (config), view-controllers which initialize a view (controller), services (factory) and more. The syntax is always [module].thing, usually abbreviated into a chain of angular.module("name", [dependencies]).config(…).run(…).controller(…) etc. Then we want to ensure that the data-binding works. For trivial cases we'll just use the ng-model="value.Value". If you stick to this, most cases will just work automatically including multi-language editing. We'll add more wrappers as functionality increases, and in most cases you'll want to stick to the default wrappers using the config-method shown in the demo-app. But there are cases where you will want to deviate from this - like if you input-type does not support disabling. I won't document the details here but if you really need this I'm sure you'll figure it out. We worked hard to create a dynamic input dialog which does NOT need jQuery because it slows down the UI, has bad programming style and bad side effects (see [todo]). Very often you may be tempted to quickly use a component which needs jQuery - and if necessary you can (just remember to include jQuery in your JS). But try to avoid it - because there is no real reason to and you'll regret it some day in the future. Almost all JS plugins developed today also exist in a non-jQuery edition, so we really recommend to use those. The simple case just binds the value.Value in a 1-to-1 fashion. You can do much, much more if you want to - but you'll need to dive deeper into AngularJS and Angular-Formly to do that. So you can do everything, but of course you'll need to learn these frameworks. Please, could you develop, if you already haven´t one, a dnn dev template incorporating all the ideas/technologies (grunt OR gulp, especially ANGULARJS, Formly OR AngularUI, ...). This would be a great boost for the community. Could you please give your ideas on this subject. Because I think you are the most knowledgeable dnn-ng developer, I ask you to develop, if you already haven´t one, a dnn dev template incorporating all the ideas/technologies (grunt OR gulp, especially ANGULARJS, Formly OR AngularUI, ...). This would be a great boost for the community. Could you please give your ideas on this subject (start a new github project OR ...). @kurt I'm constantly creating demo apps which do most of this. I simply find the 2sxc-app model more appropriate for the web as it is today, so I'm not focused on the dnn-model with server controls and all that. That's why all my demos are also 2sxc based. I'm also currently working on some grunt samples - but most tutorials need a very simple setup (so people get it), while real life then needs a bit more power :). BTW: 2sxc includes a special nodejs feature to ensure that you can work with npm/grunt and it still won't package the large node_xxx folders into your published app :).